One of the most popular of Irish yachtsmen, and a remarkably clever helmsman. He comes of a sporting family, his father being Mr. T. W. Gubbins, and his uncle Mr. John Gubbins, owner of Galtee More and Ard Patrick, and has for many years shown the keenest enthusiasm for the sport. He began his sailing career in Queenstown Harbour with open boats and sailing canoes. At Cambridge he was Captain of First Trinity Boat Club, and won the Ladies’ and Visitors’ Plate at Henley in 1881, and for three years rowed in the University trial eights. In 1883 he passed the Board of Trade examination, gaining a master’s certificate. With Wraith, 37 tons, he won eighteen first and fifteen second prizes out of fifty-eight starts. In 1891 he purchased the 5-rater Glycera, a successful racing boat. He then bought the 5-rater Windfall, which was built for Mrs. Schenley, and up to 1897, the date at which he disposed of her, he had won ninety-seven first, thirty-two second, and eleven third prizes—a total of 140 flags out of 206 starts. In one season, 1892, he made a record difficult to beat—viz., secured sixteen firsts, thirteen seconds, and two thirds out of forty-three races, the majority of which were sailed in the Solent and the Clyde. 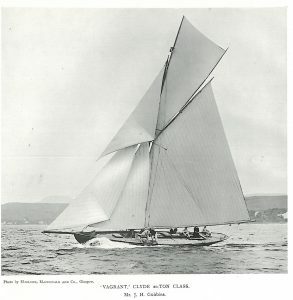 Vagrant, Clyde 20-ton Class. Mr. J. H. Gubbins. In 1894 he joined a number of yachtsmen in Cork Harbour in the building of a class of 1-raters. These boats were designed by Mr. G. L. Watson, and Mr. Gubbins’ Pigmy came out with the best record. In 1896 a new one-design class was built, with an l.w.l. of 22.6 feet. For this occasion Little Devil was built, and proved champion boat. He now owns the Little Devil, 20 tons, built to the Clyde 20-ton one-design class. This boat has also done remarkably well, with ninety-eight first, forty-one second, and eight third prizes out of 203 starts, winning prizes to the value of £1,046 to date. Clubs: Royal Alfred, Royal Clyde, Royal Clyde Corinthian, Royal Cork, Gourock, Royal Northern, Royal Western of Scotland, Royal Munster, Holy Loch. Residence: Dunkathel, Glanmire, co. Cork.